This is another cigar I received from Felipe Gregorio (full disclosure and all that). 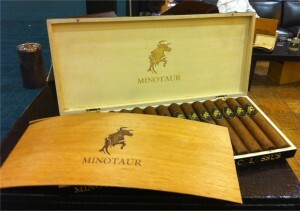 Felipe Gregorio is releasing the rosado-wrapped Minotaur at a price point of $15 a cigar for the only size in the line. Minotaur is sold in boxes of 15 and was made at the request of a prominent cigar distributor in France. It is blended to approximate the profile of Cuban cigars to make it more marketable in Europe. The cigar itself looks beautiful. The rosado wrapper doesn’t have any raised veins, has some oils, evenly packed well and no visible imperfections. Looking forward to it. A tidy group of pleasant flavors great you from the start. Mild fruitiness, tobacco, earth and some burnt hay. My one reservation about these flavors is that, at least in the beginning, they are not as strong as I would like. As the cigar progresses the flavors do gain in strength to a certain extent but not in complexity. A lack of complexity, or, to be more exact, a lack in the evolution of the flavors over the course of the cigar, is not a big problem for me as long as those flavors are enjoyable. And they are. Nearing the end now and the flavors are getting stronger, which is definitely a good sign. Good flavors. The draw is a little tight and the burn requires some pretty sizable touch ups. It is a medium bodied cigar. My problem with this cigar is that the flavors are a little weak until sometime around the halfway point. That problem is somewhat overcome by its improved performance after the halfway point. AFGL: Happy Birthday, QE2 & the Worst Cigar?